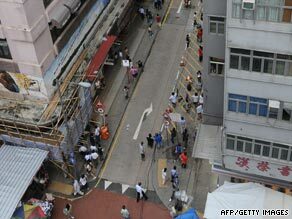 HONG KONG (CNN) -- Authorities in Hong Kong were reviewing surveillance tapes Tuesday to determine who tossed a bottle of acid from the top of a building, injuring 24 pedestrians in a busy shopping district. Overview of where acid was thrown from a building in Hong Kong's Mong Kok district. Monday's incident was the third such attack in the Mong Kok district in the last six months. Police have not ruled out the possibility that they are the work of the same person. The most recent attack occurred on Nielson Street Monday night when a bottle containing corrosive liquid was thrown from the top of a building, a police spokesman said. Among the 24 people injured was a 4-year-old child, police said. On May 16, 30 people were treated for burns after they were hit with two bottles of acid in the same area. Those pedestrians suffered various degrees of burns, none of which were serious, police said. The May attack occurred on a Saturday around the same time in the same area with bottles containing similar liquids as one in December 2008 that left 46 people injured. Authorities have set up a 24-hour hotline for information on the incidents and the government installed a new surveillance camera system in the area, worth 1.7 million Hong Kong dollars ($219,000). CNN's Roya Shadravan in Hong Kong contributed to this report.